Mr. Geesaman poses with 13 of this years 14 national ADDA award winners! At our board meeting Monday night the Cañon City School District honored 14 Cañon City High School students who placed nationally in the American Design and Drafting Association contest. 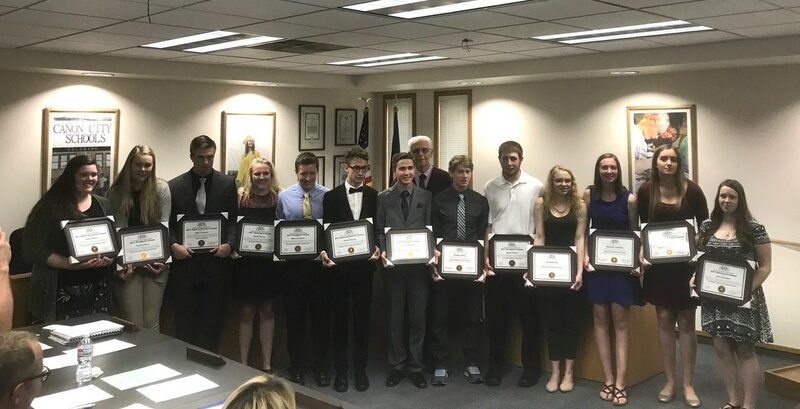 CCHS men and women have been earning these awards as long as anyone in this community can remember, thanks to hard work and dedication in the pursuit of excellence exhibited by their teacher, Mr. Michael Geesaman. It is my understanding at the end of this year Mr. Geesaman, who apparently “retired” 7 years ago, intends to finally hang up his lesson plans for good. His influence at CCHS will be greatly missed. I want to take a moment to thank him for all he has done to impact the lives of generations of Cañon City High School students! 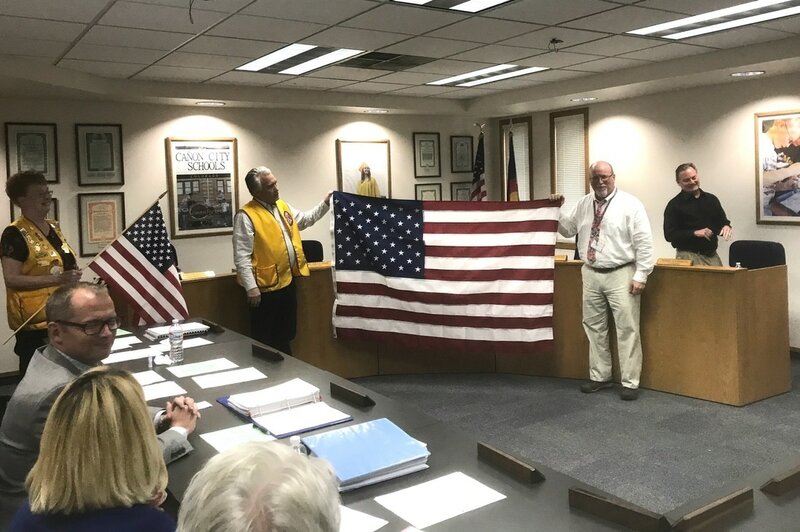 Also at our April 24th board meeting we had the pleasure of receiving quite a number of replacement classroom and school flags from the Cañon City Noon Lions Club. More than 20 flags were supplied, with a promise to replace outdoor American and Colorado banners as long as necessary. On Tuesday April 18th Fremont County Sheriff’s deputy Mike Fetterhoff was honored for outstanding work and support by the Fremont County Head Start by being given the honor of cutting the ribbon to open this year’s Safety Town fair. Mr. Fetterhoff is also McKinley Elementary School’s beloved School Resource Officer, and is simply outstanding in the conduct he exhibits with our students and staff members. Last but not least, for the 18th year in a row the Cañon City High School Encore show choir performed in the final grouping at the state competition. This year Mr. Albrecht’s talented troupe finished in 4th place. Congratulations to all! Harrison's kindergarten teachers have been hard at work meeting and placing next year's crop of students. Kindergarten roundup has been taking place throughout our school district. I encourage all parents of incoming 5 year olds to register their children for school in the fall as soon as possible. Doing so makes it easier for schools to anticipate class size and to provide the appropriate level of staffing needed to educate our children. Late last week we received feedback from the Colorado Department of Education’s Capital Construction department regarding our BEST grant application and the condition of our Washington and CCMS facilities. This information will guide what we present on May 17th to the BEST Board before they make their funding decision. As many of you know, at its meeting last Monday our board of education made final decisions related to 2017-18 administrator contracts. In the midst of all this, long time Cañon City educator Kelly Albrecht was appointed as Cañon Exploratory School’s new principal. Congratulations Kelly! I know some of the board's decisions were difficult. I also know each director spent many hours reviewing information from all interests before casting their final votes. Kelly Albrecht will be the new principal at Cañon Exploratory School. During the past two weeks I attended the Fremont County Head Start Safety Town ribbon cutting ceremony, two Superintendent Advisory Council meetings, participated in a Colorado Health Foundation grant site visit, conducted an instructional leader PLC related to academic improvement planning, attended a Fremont County Facilities Corporation board meeting, addressed issues related to administrator contract renewals, recorded a radio show with mayor Troutman and operations manager Jeff Peterson, met with Cañon City Recreation Department personnel about the availability of the ropes course for our children, attended the annual CASA fundraiser luncheon, attended a Cañon 2020 meeting, attended Washington and McKinley Elementary PTO meetings, screened candidates and participated in interviews for a new Cañon Exploratory School principal, interviewed investment bankers related to a possible facilities bond election this fall, attended a board meeting, work session, and executive sessions, and spent a lot of time on site at Harrison K-8 School. The Cañon City Noon Lions present replacement flags to the school district. On Sunday I traveled to Colorado Springs to present a breakout session on digital safety for students at the annual Parent Teacher Association state delegate convention. On Monday I hope to visit the CCMS War of 1812 museum on display in the library. I’ll also meet with district literacy coordinator Gina Gallegos, and then attend our annual employee retirement party at the Abbey Event Center. On Tuesday I’ll start my day on KRLN Radio’s Morning Line. I’ll also attend a superintendent advisory council meeting and a meeting about next year’s support contract with our learning partners at Lindamood-Bell. On Wednesday we have our monthly central administration office staff meeting, I’ll meet with our operations staff, and we have a meeting scheduled to discuss our middle school credit acquisition and recovery process. On Thursday I’ll meet with RE-2 superintendent Rhonda Roberts, then with director of special services Lynnette Steinhoff. I hope to leave work a little early to travel to Buena Vista to watch my son Stefan coach his Center Viking baseball team against the Demons. I have not yet had time to see one of his games this season. On Friday morning I meet with folks from the GE Johnson Construction Company to discuss preparations for the upcoming BEST Board meeting where grant decisions will be made. I also have a meeting about literacy coach evaluations. ​All of you will be receiving information from your child's school that we will not be holding classes on Monday May 8th. This was placed in our calendar as a flex snow day, to be taken off if we did not have to use all our inclement weather release time before then. Based on recent weather reports we are quite comfortable declaring the day off. Have an outstanding Blossom Festival week!